You will provide us information about yourself, your firm or company, and your practices when you register for certain services, or register for email newsletters and alerts. You may also provide additional comments on how you see The Family Center servicing your needs and interests. Similar to other commercial Web sites, our Web site utilizes a standard technology called “cookies” (see explanation below, “What Are Cookies?”) and Web server logs to collect information about how our Web site is used. Information gathered through cookies and Web server logs may include the date and time of visits, the pages viewed, and the time spent at our Web site. Occasionally, we may also use the information we collect to notify you about important changes to our Web site, new services and special offers we think you will find valuable. You may notify us at any time if you do not wish to receive these offers by emailing us at jmcneal@familycenterofcolumbus.com. We may use third parties to facilitate our business, including, but not limited to, sending email and processing credit card payments. In connection with these offerings and business operations, our partners and other third parties may have access to your personal information for use in connection with business activities. As we develop our business, we may buy or sell assets or business offerings. Customer, email, and visitor information is generally one of the transferred business assets in these types of transactions. We may also transfer such information in the course of corporate divestitures, mergers, or any dissolution. Occasionally, we may also use the information we collect to notify you about important changes to our Web site, new services and special offers we think you will find valuable. 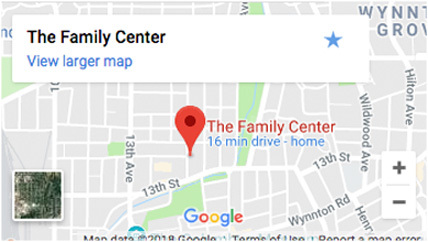 As our customer, you will be given the opportunity to notify us of your desire not to receive these offers by sending us an email request at jmcneal@familycenterofcolumbus.com.